Relieved that they have escaped the Norduscaean Blockade, Noctis and his companions are now headed towards Duscae, a region famous for its wetlands and Chocobo forest. After their conversation, they decided to stop at a gas station to fill up the car’s tank. 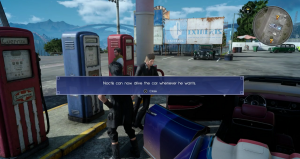 Once they arrive, Ignis tells Noctis that he can now drive the Regalia. 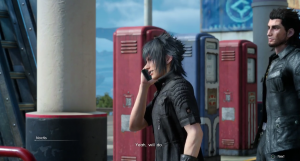 During their stop, Noctis receives a call from Iris. She tell him that they have finally arrived at Lestallum, and that she can’t wait to meet up with him. Noctis needs to meet up with Iris at Lestallum in order to finish this quest, however, Prompto will ask Noctis to visit the Chocobo Post. You can refuse to go to the post, but if you want side quest bonuses, then you should say yes to Prompto. 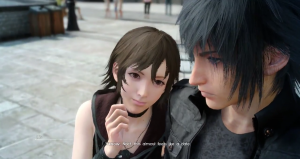 After the side quest, Noctis and his companions make their way to Lestallum to meet Iris. Once at Lestallum, head south to the Leville to meet Iris. 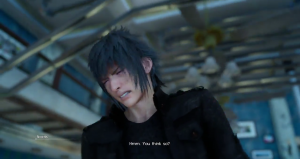 When you arrive outside the Leville, a cutscene will occur inlvolving Noctis experiencing a strange headache. After the cutscene head inside the place. Iris will greet Noctis and his companions and will offer them a room to rest. While at the room, Iris tells about what happened to the Crown City. 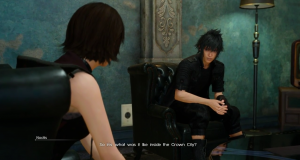 She also tells about Lunafreya being in the Crown City during the catastrophe, however, she states that Luna left right away. Iris then greets them a good night’s rest. After waking up, Noctis finds out through Iris that his companions went outside to see the sights. Iris accompanies Noctis around town to visit several places. 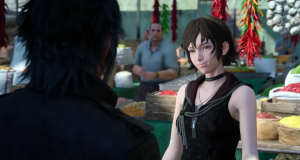 Iris first leads Noctis to the marketplace, where Iris indicates her love for buying things in the market. The second spot is the power plant. Iris states that women do all the work in Lestallum. The last spot will be the outpost. Iris suggests that the tour feels like a date. Noctis and Iris then returns to the Leville. Once at the Leville, Talcott greets you and says something about the legend of a sword that is supposed to be in a waterfall nearby. The sword may be one of the Royal Arms. 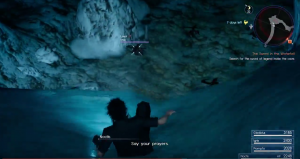 Noctis and his friends then proceed to the cave behind the waterfall. Before you arrive at the cave, there will be several Shieldshears near the entrance, defeat these enemies and proceed inside the cave. Once inside the cave, you would need to traverse deep into the area to find the sword of legend. The path leading down below will be slippery and steep, so watch your step. You may get lost in this dungeon, but just follow the quest mark in order to not get lost. At the entrance of the cave, walk to the left and there will be Flans appearing to block your way down. After defeating them, proceed to glide down in the slippery slope. Once you’re down, there will be Imps appearing, defeat them. When you defeat them, move up towards a small cave. Follow the path and then move to the right. Glide down the slope, and then fight the Arachne in the area. When you defeat the Arachne, head to the right through the narrow path. Then go right again, and then proceed to the left and defeat the Flans that appear. Once you defeat the Flans, head straight into another narrow path, then move left. Make sure that you are still following the direction of the quest marker. Once you’re in another narrow path, head to the left and defeat the Ronin and some Flans. Head to the right path going down and then defeat the Arachne and the Tarantula. Once the battle ends, head south. There will be an Arachne, a Tarantula, and some Imps on you’re way towards the quest mark. After you defeat them, follow the location of the quest mark. You will be lead to an area surrounded by ice. Some Mindflayers, Imps, and Flans will appear in the area. Defeat the monsters and head to towards the quest mark. There will be a door once you get to the quest marker. Head inside the Tomb of the Wanderer. When you are inside, touch the tomb and it will give you the Armiger, one of the royal arms. Once the cutscene is done, you will be transported outside. 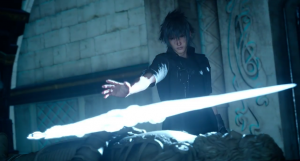 Noctis will experience another headache, it seems that it gives him several images concerning The Meteor. Return to the Leville to take some rest. 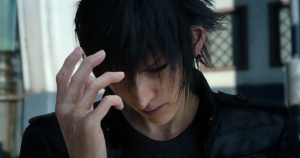 Once inside, Noctis will then feel another headache, prompting his friends to investigate what is happening to Noctis. They decide to visit the outlook. When they arrive at the outlook, they will meet the suspicious stranger. 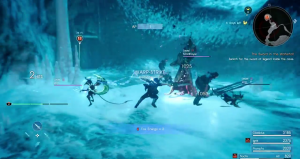 The stranger wanted Noctis and his companions to follow him to his car. 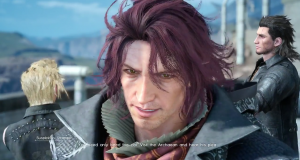 Ardyn seems to know something about the Archaean, whom the group wanted to visit, so they allowed the stranger to accompany them to where the Archaean is. You will be given a choice to drive Ardyn’s car, the Regalia, or just be a passenger. Once you’ve decided, Chapter 4 begins.